In theory, muffins are a very simple thing to bake, but in practice, there is a lot of variation between them. Some bakers make them high, light and fluffy, like a cake, while others make them relatively dense and close-textured. Some bake oversized muffins with an extravagant top, others keep them small enough to stay inside their paper cup. Every baker finds a personal comfort zone along that range of variation and finds or refines recipes accordingly. If you like yours light, here are a few tips. One of the common reasons for muffins to become dense and chewy is overmixing. The standard technique for making muffins is very simple. You sift your dry ingredients together and whisk your wet ingredients together. Then, you combine the two, stirring until they're just mixed. It usually only takes 10 to 12 strokes, at most, with your wooden spoon. The batter, which should be lumpy and not smooth, will usually show a few spots where the flour has not been entirely mixed in. This is a good sign. Don't mix the batter until it's uniform and smooth and don't use your stand mixer. Your choice of flour also has a bearing on how light and fluffy your muffins will be. Whole grain flour, and other grain ingredients such as oats and bran, tend to make your muffins denser and heavier. This is neither good nor bad, just a matter of personal preference. However, if your goal is lighter muffins, use three parts white unbleached flour for every one part of another grain flour. This adds nutrition, but keeps the muffins light. Using cake or pastry flour instead of all-purpose also helps give them a softer, fluffier flavor. Muffins use baking powder or baking soda, or both, to generate the "rise" that makes them light and fluffy. Use too little and they won't rise enough, use too much and they will rise quickly and then collapse. Compare your recipe to others and see how much leavening they use. 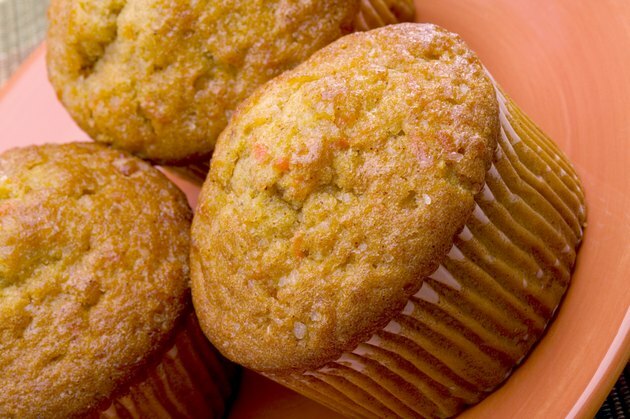 Some muffin recipes are mixed like a cake by first creaming the butter and sugar together and then adding the eggs and the remaining ingredients. This method is is more complicated than the "dump and stir" approach, but creaming the butter and sugar creates air pockets that help the muffins rise up light, flaky and cake-like. Your baking technique is another important factor in making light, fluffy muffins. During the first 10 to 15 minutes of baking, your baking powder and baking soda are reacting in the heat, producing carbon dioxide to puff up your muffins. For the best result, preheat your oven to 425 degrees Fahrenheit, rather than the 350 to 375 F called for in most recipes. Once the muffins are in, reduce the temperature to whatever your recipe calls for. It is very important not to open the oven for at least the first 10 minutes until the rising is finished. How Important Is It to Have Baking Soda in Banana Bread?